The LMB hosts one week work experience placements in June-August for up to four students in Years 10-13. The LMB also participates in the Nuffield Research Placement scheme. If you are an undergraduate level student, you may be interested in our summer studentships. Our exciting work experience placements allow you to find out more about working in science and give you the chance to experience the breadth of scientific and support activities which take place in a research institute like the LMB. Through our programme of work experience activities, you will get the opportunity to shadow a researcher and take part in lab work, learn about and help out with specialist techniques such as flow cytometry and NMR, and experience the work of science support teams such as media prep and glass wash.
We are looking for students in Years 10-13 who are enthusiastic, interested in and show a flare for the biological sciences. You should be keen to learn, enjoy meeting new people and being challenged. You should also have good attention to detail and the ability to follow instructions. CV (this should include a list of the subjects you are studying with predicted/obtained grades, and brief details of your extra-curricular activities, hobbies and any previous work experience). 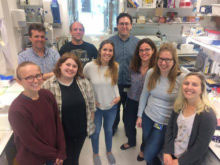 Statement explaining your reasons for applying to the LMB and the areas of LMB research that interest you or in which you are keen to gain experience. Your statement should be no longer than 400 words. Your answers to these questions will not be used to judge your application. Up to two work experience placements will be allocated from applications received by Friday 4th January 2019. We will respond to applicants letting you know whether you have been successful or not by Friday 18th January 2019. Up to two further work experience placements will be allocated from applications received by Friday 22nd March 2019. We will respond to applicants letting you know whether you have been successful or not by Friday 5th April 2019. We can accept applications from UK and EU nationals, and all international students who have a visa allowing them to undertake unpaid work in the UK. Nuffield Research Placements give students in their first year of a post-16 science, technology, engineering and maths (STEM) course the opportunity to work in leading STEM-focused industries, research institutes and UK Universities. Projects last 4-6 weeks during the summer holidays and involve working alongside practicing STEM professionals. Students who don’t have a family history of going to university or who attend schools in less well-off areas are particularly encouraged to apply. Applications for Nuffield Research Placements are administered regionally throughout the UK, and should not be sent directly to the LMB. Further details on how to apply for a Nuffield Research Placement can be found here. Amy with her supervisor, Leticia, and the rest of the Sale group at the LMB.